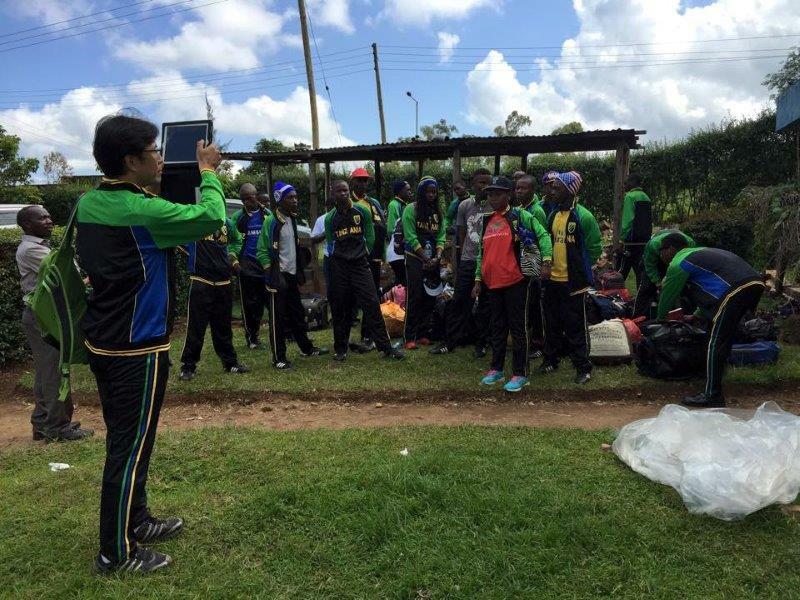 THE national baseball team that will participate in the Africa Championship in Meru, Kenya was bid farewell on Thursday morning ahead of their departure on Saturday. The team was presented with the national flag at the residence of the Japanese Ambassador to Tanzania, Masaki Okada and was also attended by various government officials, Tanzania Baseball and Softball Association (TABSA) officials and other sports stakeholders. The squad was announced on Sunday evening after the National Baseball Competition that ended at Azania Secondary School and was sponsored by the Japanese government through the Japan Sports Council under the 'Sport for Saturday' programme that aims to reach 10 million people in 100 countries by 2020 to promote sports. The 18-member team plus seven officials are faced with a heavy responsibility as this is the first ever international baseball championship Tanzania is taking part in. The Assistant Director of Sports in the Ministry of Information, Youth, Culture and Sports, Alex Nkenyenge, called on all the players to believe in themselves and remember that they are representing their country in the competition. "I believe you will do big things and I really congratulate you for being members of the very first national baseball team," he said. He thanked the Japanese government for the good gesture shown in supporting the just ended National Baseball Competition and called on the players to repay back by winning and bringing the trophy back home. Ambassador Okada, showered praise on the new national team and said he was impressed by the development that has been recorded so far in promoting baseball in Tanzania. "It is only a year since this game was introduced in Tanzania but you have mastered it so fast and the just ended National Baseball Competition is a true testimony as the games were competitive and we were all excited," he said. Okada said he hoped that the Japanese government would continue to support the game in Tanzania. The team Manager Shinyo Tomonari said he is confident the team will perform well in the Meru championship. Head of delegation Alpherio Nchimbi, who is also the TABSA Secretary General, said they were ready for the challenge and would do everything possible to bring the trophy home. "We are going with one aim, to win and bring the trophy home ... all the players are ready and have been training together for one week. We thank the Japanese government for their support and we also thank the Tanzania government for supporting us this far," he said. Those selected include Ndashau Douglas, Ramadhan Ramadhan, Chacha Magaiwa, Mtenya Ismaily, Noel Nmary, Abdallah Abdallah, Christopher Sise, Sallah Juma, Mbugi Mussa, Justine Castro, Marwa Geoffrey, Mkama Martin, Chacha Edward, Said Anwar, Luangisha Leodgar, Twalibu Abilah, Ibrahim Mpangala and Sheka Peter. The championship that will determine teams taking part in the Baseball World Cup in Tokyo next year will run from December 15-20.